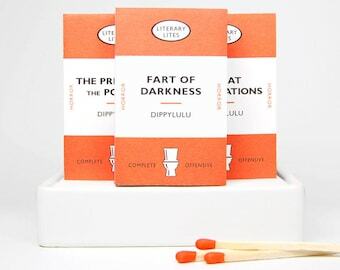 Stocking stuffer matchbox gift -- Literary Lites IV. Library gift. Book lover gag gift. Novelty matchboxes. Set of three mini book matches. To counter this smelly syndrome, we have turned to some of the finest wordsmiths in the English language. These matchboxes pay homage to classic works of literature as a distraction from some of life’s earthier moments. Sometimes words speak the loudest after all. Modeled on the classic design of one of the world's greatest book collections, Literary Lites are perfect for every room in the house—or as a gift for your favorite literati. Each Lite refers to a different literary classic. The back cover features a brief plot summary, sure to lift your spirits at times of need. Even your most fetid productions will be transmogrified into immortal literary expressions. Etsy has a new policy and I'm not permitted to sell you loose matchsticks. According to Etsy Marketplace Integrity team I can only sell matches with the sticks secured in the box. Please be aware this does not affect the quality or functionality of the product. Gag gift for book lovers -- The Complete Works of Literary Lites. Stocking stuffer gag gift - Literary Lites III. Novelty white elephant gift. Book lovers delight! Mini book matchboxes. Dippylulu classic. Stocking stuffer funny gag gift matchboxes -- Literary Lites V. Novelty matchboxes for literary lovers. Hilarious book jokes. Novelty stocking stuffer tiny book gag gift set -- Literary Lites II. Hilarious literary lovers gift. Matchboxes that look like mini books. Stocking stuffer gag gift parody matchboxes -- Harold Potty Lites. Literary lovers secret santa. Anti Valentine book lover funny gag gift matchboxes -- Mature Anti Love Literary Lites. Boyfriend gift. Girlfriend gift. Book lover gift. Valentine matchboxes -- Lovely Literary Lites. Girlfriend gift. Boyfriend gift. Lovers gag gift. Cute and funny literary gift. Book lovers. Stocking stuffer funny gag gift matchboxes -- I Heart Lites hides the evidence. Cute, I bought this as an Easter Basket filler. Stocking stuffer gag gift matchbox Literary Lites -- When the air thickens, so should the plot. Tiny mini matchbooks. Dippylulu classics. I'm sorry, I only accept cash or cheques if you're my Mum. Returns are considered on a case by case basis. Please contact me with any questions. Everything listed is in stock and ready to ship excluding custom items. I aim to ship within 48 hours of payment excluding weekends and holidays. If in your experience it has been known for packages to go missing or get damaged on the way to your home, please contact me to arrange some insurance. It's not me that farts a lot. Honest. Stocking stuffer joke gag gift bathroom matchboxes MATURE -- Harbour Lites. Shits ahoy boat lovers gift. Hello sailor! 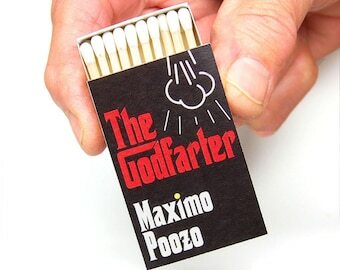 Funny matchbox stocking stuffer novelty gag gifts for sneaky farters -- Got Lites. Hilarious anti valentine gag gift matchboxes -- Anti Love Literary Lites. Lovers tiff. Anti valentine gift. Boyfriend gift. Girlfriend gift. Party favor and hostess gift, funny fart gag gift -- Flaming Fortunes. Set of 6 mini matchboxes. Stocking stuffer novelty matchbox gag gift set - Keep Calm and Carry On parody. Funny cute gift.